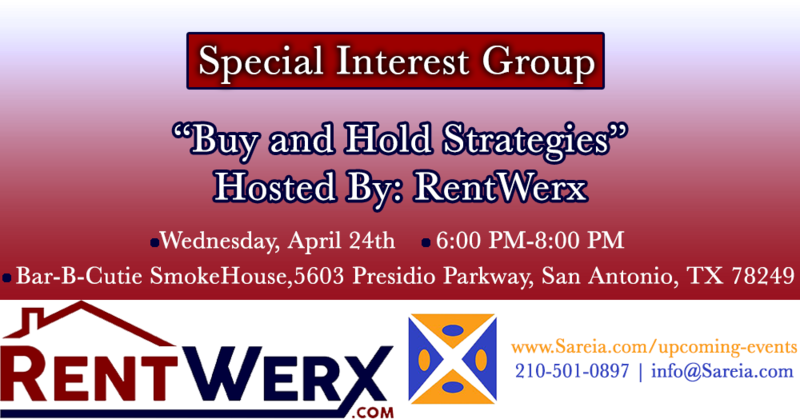 Join us on April 24th 6:00PM - 8:00 PM at Bar-B-Cutie for our Special Interest Group presentation, "Buy and Hold Strategies" hosted by RentWerx featuring Brad Larsen! Long term rental properties are widely considered one of the best ways to diversify any real estate portfolio. The right buy and hold real estate can yield both short term gains and long term appreciation. There are many investors who are intimidated or confused with how to get started. However, I can assure you that buy and hold real estate may be one of the best investments you make, if you mind due diligence before you jump in. Email us at info@sareia.com or call 210-501-0897 if you have any questions!